Perkins 75-173 horsepower models are built on more than 80 years of innovation and on-the-job customer insights. The design of these engines is based on proven technology that has excelled in environments around the world. These engines offer best-in-class power density in a compact package, and are ideal for skid steer loaders, telehandlers, agricultural equipment, and a wide variety of other off-highway applications. 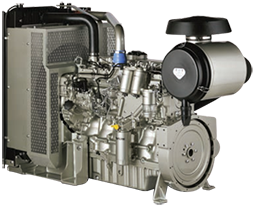 Designed with input from OEMs, Perkins 75-173 hp engines optimize fuel consumption and lower ownership costs. We also offer our own line of remanufactured engines. Perkins replacement Industrial Open Power Units are engineered to be a plug-and-play solution for your equipment. All are available with multiple build configurations to match your power needs, and are built with an innovative design that decreases both integration downtime and application engineering costs. The advanced common-rail and mechanical fuel system technology in these engines delivers high power density and excellent fuel economy.